The Skechers GOwalk 3 technology consists of GOga Pillars that feature a strong shock absorbing sole and GOga Mats that provide high-rebounding cushioning. 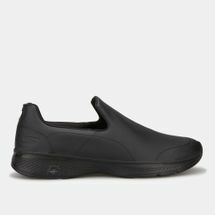 These functional yet comfortable shoes feature uppers including a soft striped fabric, one-piece mesh and more in a slip-on technical walking sneak design. The Skechers GOwalk 4 also features innovative 5GEN midsole design with the new Skechers GOga Max insole for the best walking experience ever. 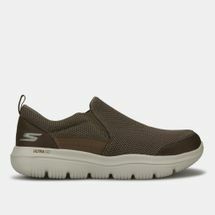 Get yourselves a pair of Skechers GOwalk shoes from Sun & Sand Sports online and have them delivered to your doorstep in Kuwait City or anywhere else in Kuwait. Introduce yourself to a new way of fitness with the Skechers GOwalk shoe series. Perfect for athletic cool-down footwear, the GOwalk series features some of the most innovative and highly responsive 5GEN midsole cushioning along with 5th Generation design that allows it to provide you with a high energy return with every step. Whilst boasting highly technical features, these shoes are aesthetically funky and pleasing to the eyes with their unique look. 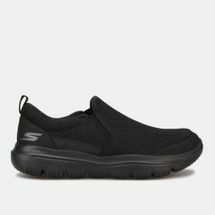 Skechers GOwalk shoes are designed to allow you an easy slip-on of the shoe and are lightweight in build so as to give your feet a more natural, barefoot feel – giving you ultimate comfort in return. Interact with almost any surface with these shoes as they flex and bend just like your natural feet would, but now with an added layer of protection – so you can step on any surface you like without having to worry about your feet. The Skechers GOwalk shoes for men and women have constantly evolved since their initial launch in 2012. Now, the shoes feature technologies such as Goga Pillars, Goga Max, bamboo lined footbed, tapering midfoot design, single seamless construction, mesh upper engineered to expand naturally with your foot as you walk, along with many others to give your feet the best. Shop online now with Sun & Sand Sports and get these shoes delivered to your doorstep in Kuwait City or anywhere else in Kuwait.